LHA-3 Features: -Includes a neoprene travel bag for easy transport, storage and serves as a mouse pad. -Material: Aluminum. -Ergonomic and patent design. -Folds flat for easy storage and travel. 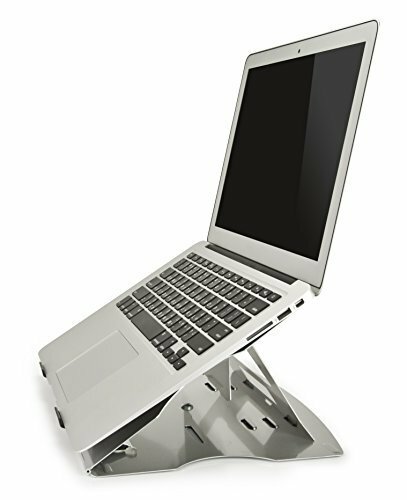 -Built-in swivel base for easy viewing angle adjustments. -Corrosion Resistant: No. Dimensions: -Folds: 12.5'' H x 9.5'' W x 0.5'' D, 1.3 lbs. -Rises laptop up to 7'' offering laptop heat dissipation. Overall Height - Top to Bottom: -5". Overall Width - Side to Side: -12". Overall Depth - Front to Back: -9". Overall Product Weight: -2 lbs. If you have any questions about this product by Aidata, contact us by completing and submitting the form below. If you are looking for a specif part number, please include it with your message. Pwr Laptop Table Stand Adjustable Riser: USA Seller 2Y Warranty Portable with Mouse Pad Fully Ergonomic Mount Ultrabook MacBook Notebook Light Weight Aluminum Black Bed Tray Desk Book Fans Up to 17"